I’m Mary and I reside in the beautiful Hudson Valley area of New York. I’m married with no children, 2 horses, one crazy dog and one very sweet cat. I have dabbled in Needle Arts since 3rd grade when my mother taught me to knit and sew. As a young wife in my early 20’s I wanted to decorate my apartment so I took up crewel work, stitched colonial knotwork pillows and embroidery. I stitched this tablecloth for my mother in my early 20’s and it is now passed down to me. Many memorable dinners were shared over this tablecloth and it is now a treasured possession. Candle banner from our very first post! Christmas 2012, RJ gifted me this sweet framed “Good Friend” in French. It was her first counted cross stitch after a long absence from stitching. I was so impressed with her meticulous stitching and intrigued that you do not follow a stamped pattern. Fast forward to Summer of 2013, I had fallen off a ladder and needed to occupy my time as I was confined to bed for a few weeks. With RJ’s encouragement, I tried counted cross stitch and was hooked! RJ’s gift to me that started my cross stitch obsession. 3. How long have you been blogging and what inspired you and RJ to start a joint blog? RJ and I both have a love of French Country decorating and we met on an on-line decorating board. 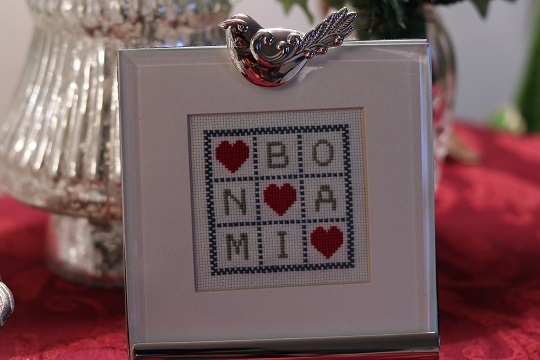 Our first shared interest was decorating, then stamping and ultimately, we both became obsessed with cross stitching. One of the reasons we started the blog was to motivate ourselves to finish our stitched pieces and hopefully to inspire others to take up the hobby. I’m pretty much of an OAAT stitcher and only recently started to rotate projects. Over the past few years we have discovered so many talented designers and the designer that speaks to me is Brenda Gervais of With Thy Needle and Thread. I am most proud of Valentine Sampler by Brenda Gervais, as it was my first attempt at stitching on 40 count linen, a major accomplishment for myself. As it was a gift for RJ, and my finishing skills are lacking, I had Faye from Carolina Stitcher blog finish it for me. I have had several stitching disasters of late but this one was the worst. 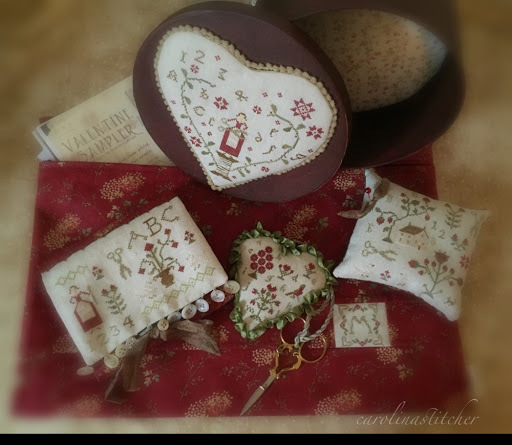 I had searched high and low to purchase Blessings be Thine by Blackbird Designs to stitch for RJ. When I could not find the pattern I decided to stitch it by following a photo I found online. I spent many hours IFO the computer deciphering the pattern and stitching. One day I noticed a small spot on the stitch and tried to hand wash it out, disaster struck! I chalk it up to bad karma for following a photo to stitch. I hope that some day I will enjoy the process of finishing my stitching and I would like to incorporate embroidery stitches and become more creative in my finishing. I love to stitch but dread finishing so I certainly have a box of UFO’s! Most of my finishes have been little pillow ornaments but one of our blog goals is to show a variety of ways to use cross stitch in decorating. One of my favorite stitches this year was a whimsical stitch called Pumpkin Hollow by Fanci That. I take my dog for long walks in the woods each day and I always hope that I will run into a bear on my hikes. I am bear crazy!! 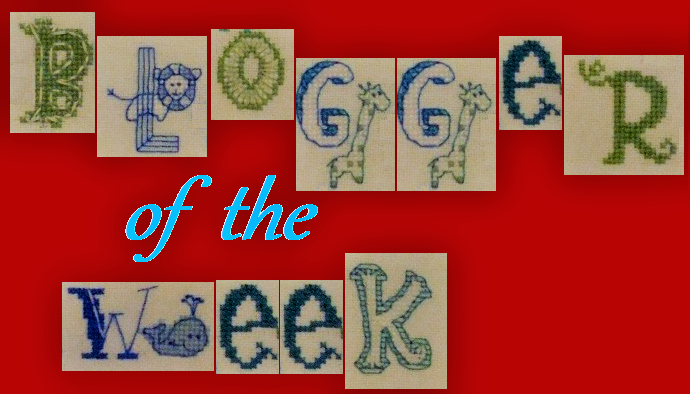 Thank you Jo for inviting Stitching Friends Forever to participate in Blogger of the Week. RJ and I are truly honored! We are so blessed to have met so many new stitching friends through our little blog. Most rewarding has been sharing this adventure with my dearest friend RJ. Oh Mary I enjoyed seeing your pieces again and learning more about you. I think I may just say that you are CRAZY for wanting to meet a bear!! Be careful my dear!! Lovely to read more about your stitching journey, Mary. I think that your finishing is very creative and I love the designs that you choose. However, I am with Vickie - no meeting bears in the woods for you!!!!! 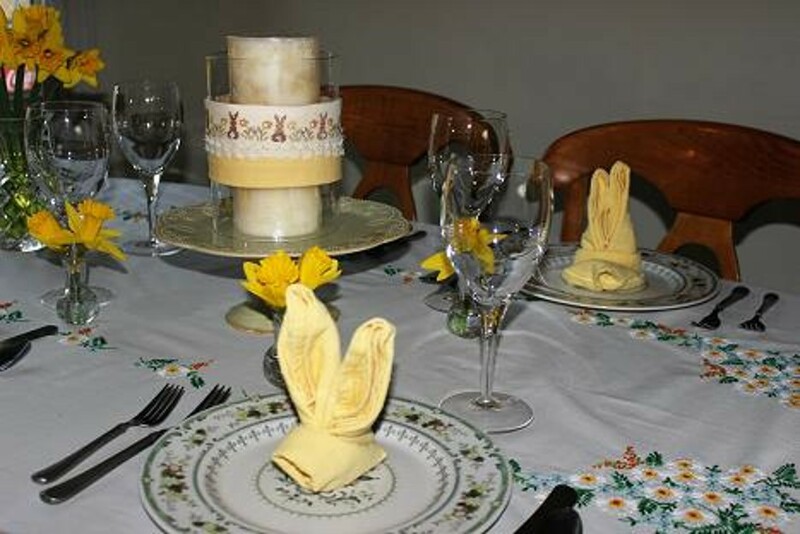 Ohhhh I see a table full of daffodils! Your valentine sampler is lovely. I'm a little afraid of finishing as well because things Must Be Perfect. Meet a bear! After seeing what my aunt has to do to keep them out of her house, noooo way! I'll stick with teddy bears lol! Lovely to read more about you Mary , I am so happy you joined us in our stitching blogs . Yours and JRs stitching is so beautiful. Thanks for sharing Mary as blogger of the week. I so enjoy the Stitching Friends Together blog. And now I have found your blog through RJ and Mary! I love finding new stitching blogs. I have been cross stitching for almost 40 years but I can still learn new things. 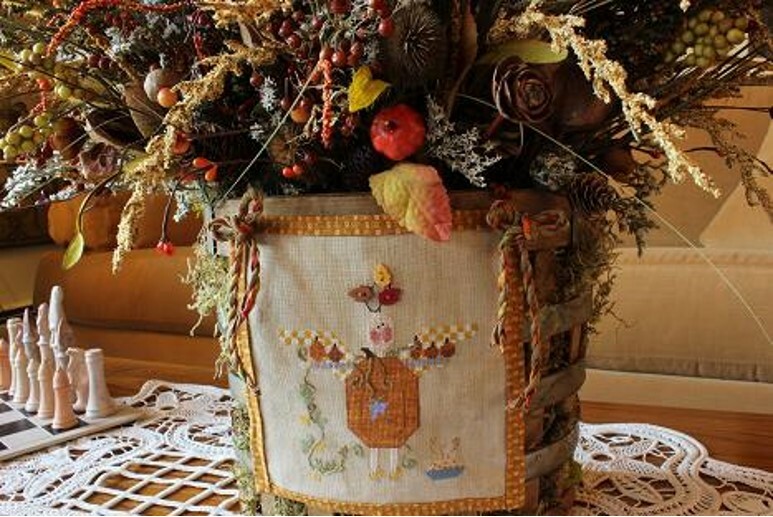 It's lovely to read about you Mary and how you and RJ got to know each other.Beautiful stitching,especially your heirloom table cloth and an eye opening ambition to meet a bear! Love your blog Mary and was happy to learn more about you here. Your stitching always impresses me as does your finishing! I really love Pumpkin Hollow!! That is to bad about your stitching disaster. Do you still have it? Maybe you can tea dye the entire piece? not sure if it will cover the entire stain or not but it may be worth the try? Ugh--so sorry about the Blessings Be Thine disaster. I have tried to find that chart, too, but refuse to pay the inflated prices that they are asking on Ebay. Oh, my--a bear! You are one brave hiker :) I hope you have a BIG DOG!! Having a stitching BFF must be so much fun! Nice to meet you, Mary. So nice to read your interview, Mary, and to get to know the other half of the Stitching Friends Forever blog. It's always so interesting to learn how all the different stitchers started their stitching careers. 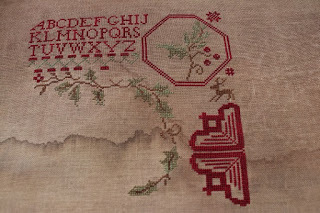 The Valentine sampler that you made as a gift for RJ is just gorgeous. Lovely to read more about you Mary. I love hearing how other stitchers got into stitching. Your finishing beautiful.